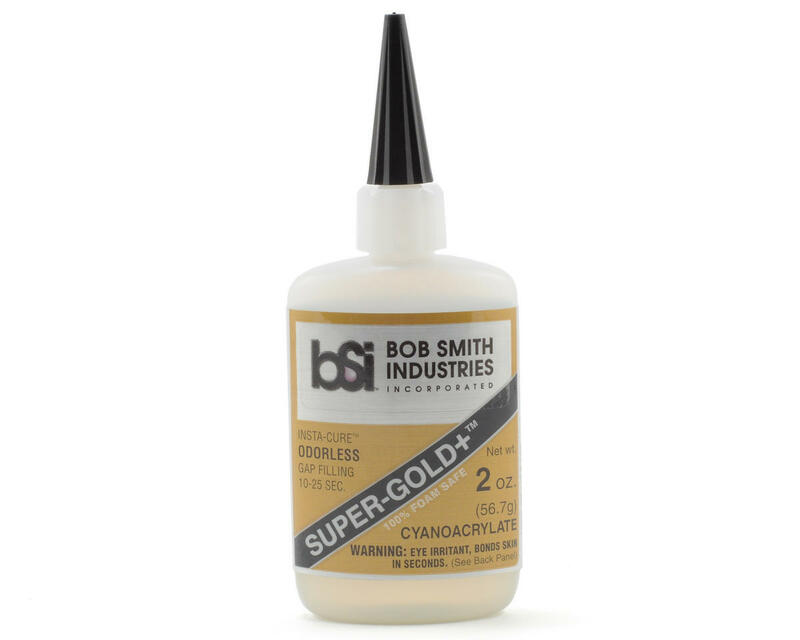 This is a two ounce bottle of Bob Smith Industries SUPER-GOLD+™ Gap Filling, Odorless, Foam Safe CA Glue. SUPER-GOLD™ and SUPER-GOLD+™ are BSI's odorless INSTA-CURE CAs. They are non-frosting and take only 2 or 3 seconds longer to bond. There are no fumes that irritate the nose and eyes. The SUPER-GOLD™’s do not attack white foam; therefore, they can be used in the building of foam core wings and the assembly and repair of plastic and foam ARF’s. They will not fog clear plastic. SUPER-GOLD+™ is ideal for attaching clear canopies in plastic model kits; however, MAXI-CURE™ is still recommended for assembling the rest of plastic kits. Wood can be bonded to white foam with SUPER-GOLD +™ in less than fifteen seconds. For bonding foam to foam, spray a very light fog of INSTA-SET™ to one piece and apply SUPER-GOLD+™ to the other before joining. Excess INSTA-SET™ may create too much heat, which can melt the foam. Both SUPER-GOLD™’s cure to a more flexible consistency for better shock absorption. Whenever a large amount of CA is to be used in such applications as saturating fiberglass or Kevlar, SUPER-GOLD™ eliminates the irritating fumes from the evaporating monomer that make repeated use of CA unpleasant at times.